I don’t know about you but I have three very specific foods that remind me of being a carefree little kid during summer break. While not the healthiest foods out there (and certainly not ones I would regularly eat today) they were kind of the iconic foods of summer for a kid. Can you guess what those are? My gosh how I would go absolutely bananas for funnel cake. I lived in a rather small town and when that County Fair rolled in I could smell the funnel cake from a mile away. It would drive my wild during that two week period of time because I wanted ALL THE FUNNEL CAKE I could get my hands on. There was something so fun and tasty about those powdered sugared covered funnel cakes. You would take that first warm bite, powder sugar would fly everywhere, and you would look up with the biggest smile on your face, hoping everyone around you could FEEL that satisfaction you had simply from one bite of that fried doughy goodness. With the exception of my funnel cake pancakes, I hadn’t given much thought to funnel cake in recent years. Being gluten free it simply wasn’t an option. I don’t really frequent places that sell funnel cake regularly, so the smell wasn’t there to lure me in. Plus the sugar…I just don’t enjoy sugar like I did years and years ago. And then one day… I really NEEDED funnel cake! Like really, really, really needed funnel cake. 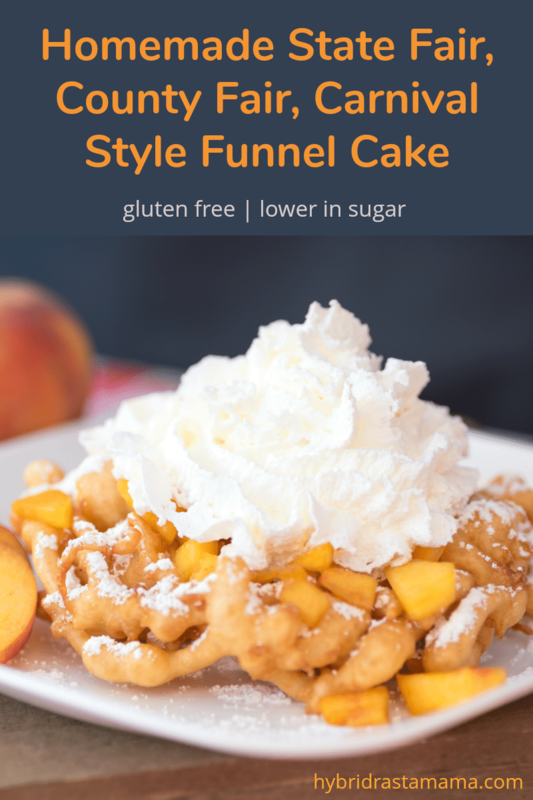 It was just one of those things and so I decided I might as well just roll with it and create what I hoped would be the best carnival style gluten free funnel cake recipe on the internet. It took a few tries but I finally figured out how to get that doughy soft inside texture that makes funnel cake, well, funnel cake. Regular gluten free flours weren’t cutting it. Too dry. Nut flours and coconut flour were a no-go too. Too mealy. But cassava flour???? PERFECTION! 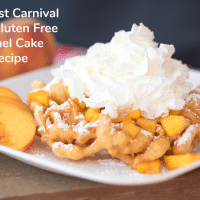 The best carnival style gluten free funnel cake was born! So let’s go get you the recipe that rocked my world! 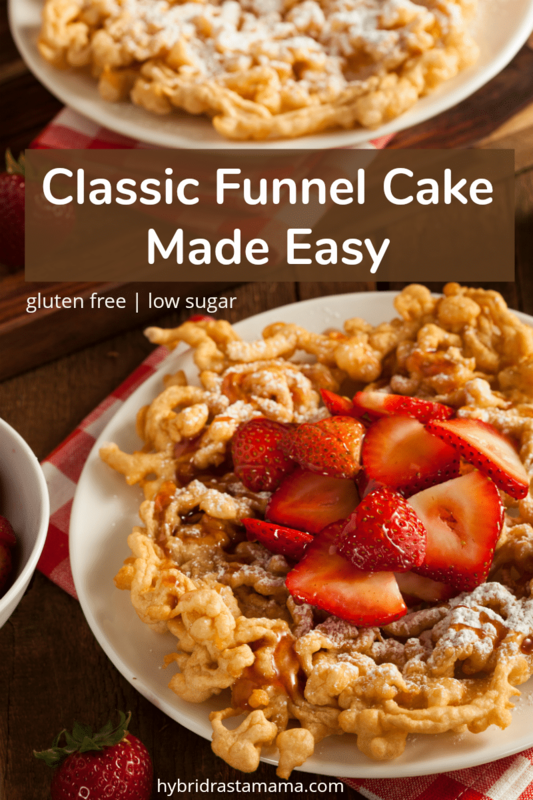 It’s an easy funnel cake recipe and it is even a bit lower in sugar than most other recipes out there. Win win! The classic funnel cake – warm, slightly chewy with that crispy fried outside. Dusted in powdered sugar that would fly off in every direction as you took that first warm bite. Fair food at it’s finest. What if I told you that you could create that same funnel cake in your own kitchen using healthier (but just as tasty) ingredients? You can! 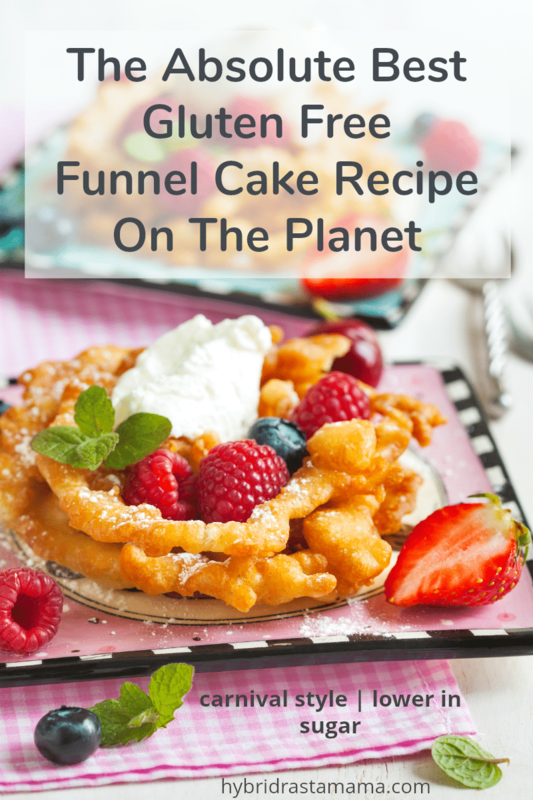 This funnel cake recipe is gluten free and lower sugar too. This website provides approximate nutrition information for convenience and as a courtesy only. Nutrition data is gathered from Nutritionix. Nutrition information can vary for a recipe based on many factors. We strive to keep the information as accurate as possible, but make no warranties regarding its accuracy. We encourage readers to make their own calculations based on the actual ingredients used in your recipe, using your preferred nutrition calculator. Do you have any favorite memories of funnel cake? Do share!